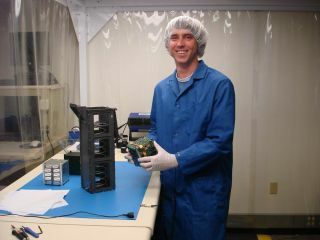 CubeSats are small and compact sensor-laden satellites that can help monitor phenomena of interest, such as Earth's upper atmosphere. LOGAN, Utah – The International Space Station would be an ideal launch platform for dispatching tiny spacecraft to perform a variety of Earth-oriented scientific research tasks, some experts say. The idea of using the $100 billion ISS as a platform to pop out sensor-laden probes has captured the attention of small-satellite makers, who are contemplating deploying palm-sized satellites called CubeSats from the orbiting laboratory to study phenomena of interest. One study, sponsored by the National Science Foundation, has focused on an ISS CubeSat Ejection System (ICES). The space station would serve as a responsive-launch platform from which multiple CubeSats could be ejected, buckshot fashion, to support missions studying the Earth's ionosphere and thermosphere region. "This is a really complex region of the atmosphere ... There's a lot going on. It's hard to tell what's going on," said Phillip Anderson of the Space Dynamics Laboratory at the Utah State University Research Foundation, in North Logan. The strategic location of the ISS makes it an ideal platform from which to address rapid-response science questions, Anderson said. For example, CubeSats can carry out on-the-spot measurements of space weather phenomena tossed out by the sun that impact Earth. The ISS platform itself is already an internationally accepted resource, Anderson noted. Numerous satellites could be deployed from the sprawling station – specifically from the Kibo Japanese Experiment Module, one of the station's numerous facilities. Anderson said that the National Science Foundation-supported study took into account various factors, such as the angle and speed with which CubeSats could be ejected from the ISS, to ensure the mini-satellites would not endanger the crewed space station. The space station could keep a stable of CubeSats ready and waiting to be deployed when the need arose. "We're talking about responsiveness," Anderson said. "If you need a constellation [of satellites] maintained … if one falls out of orbit, you eject another CubeSat and you maintain your constellation." One group that's got a leg up on placing CubeSats onboard the ISS is the Space Systems Laboratory at the University of Kentucky. The laboratory program considers the use of high-altitude balloon experiments and suborbital missions to the edge of space and back, as well as orbital flights, said Jim Lumpp Jr., director of the laboratory. "There's definitely a progression" regarding how best to build, evaluate and test CubeSats, Lumpp told SPACE.com. "You can increase your technical-readiness level by exhibiting operation in space," he added, underscoring the usefulness of testing CubeSat designs onboard the ISS. The Space Systems Laboratory has been working with private-sector space startups NanoRacks and KentuckySpace to use a standard rack that plugs into the space station, an interface that could be used to host microgravity research experiments. CubeSats can be loaded with micro-sensors to provide valuable science information as they circle Earth. "You want to flight-qualify CubeSats … You don't want to be doing engineering experiments free-flying," the University of Kentucky's Meetra Torabi of ISS operations told SPACE.com. "The CubeLab offers a great avenue to do technology demonstrations onboard the ISS." Torabi emphasized that the CubeLab idea also promotes a faster time period for CubeSat development – from idea to actual orbital flight – that could occur within a student's university tenure. Astronauts onboard the station have appraised a number of CubeSats following university-made video tapes of the do's and don'ts of evaluating the spacecraft, said Lumpp. As for the CubeSat future, Lumpp told SPACE.com that near-space ballooning, suborbital testing, and evaluation onboard the ISS would make up a good step-by-step direction. "Having small dedicated rockets that can launch CubeSats and nanosats … well, that'd be nice." Lumpp added: "Launching CubeSats from the space station or launching them from vehicles servicing the station is an excellent way to do a lot of science."